One of my several food-related volunteer projects is with Just Food. 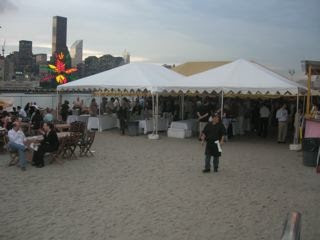 Tonight they had their first big fundraiser gala at Water Taxi Beach. Chefs, wineries, breweries and food purveyors from in and around the New York area showcased their talents. As a press coordinator, I had a lot of fun talking to writers and bloggers about Just Food. The honorees included a Gardener, a food advocate and local city council member. Anne Lappe, a food advocate, ignited the audience with her accolades for Just Food and calls to action to buy local. I spoke with the lovely Michael Anthony, executive chef at Gramercy Tavern, who served grilled kielbasa. My personal favorite taste was Telepan’s beet and goat cheese perogis (which are what I call Polish raviolis) which were pan-fried and bursting with juicy beet flavor. There was no shortage of heirloom tomatos and goat cheese hor douvres in every variety --- yellow, green and red. When my friends arrived, Mimi Friday and Martha Leighton, I joined them in tasting some wine. I will add that when it comes to wine, I rely on my resident expert, California wine loving husband, Henry, but tonight I wanted to be adventurous and try a few Long Island wines made from local grapes. A red wine lover, first I tasted Palmer 2004 Cabernet Franc (Aquebogue, Long Island) then tried the grape at the table next to Palmers, the Martha Clara 2003 Cabernet Franc (Riverhead, LI). I was impressed. Both were fruity wines with a hint of spice and herbs and to me a lot smoother (with less alcohol) than the California Cabernet Sauvignon’s my husband buys. With a little research I learned that Cabernet Franc is pronounced KA-behr-nay FRAHN; FRANGK, Cabernet Franc does well in cooler climates such as Long Island (and upstate NY) and the grapes ripen early. Typically, Cabernet Franc grapes are blended with merlot or cabernet sauvignon grapes but these adventurous LI wineries have both produced a stand alone 100% Cabernet Franc wine that is unique to cooler regions such as the north and south forks and upstate NY – uncork New York. Take that C-A-L-I-F-O-R-N-I-A. If it’s grown locally pair it with a locally produced wine. Just Food helped start and runs about fifty CSAs in the five boroughs and connects farms from Long Island, New York and the tri-state region with veggie-hungry urban dwellers like me (Chubby Bunny NYC is part of Just Food’s CSA program). Just Food also has a city farms project and raises chickens. Just Food is about the food but also about food justice and access by all to healthy food, including some of the city’s poorest neighborhoods. Ricks Picks New York City - for pickled cucumbers, beans, beets, peppers, even OKRA! Gramercy Tavern Restaurant in Flatiron -- best restaurant in NYC in my humble opinion and another fine dining experience that features locally grown produce on their everchanging and seasonal menus.